Understanding what the Bible teaches about itself is an issue of central importance. However, correct theologies of the Bible can be expressed in non-biblical categories; and it would be foolish to believe of the Bible what it does not claim for itself, whether implicitly or explicitly. Part One gives an overview of the four elements of this summary statement. Parts Two to Five offer studies of selected Old Testament and New Testament texts that cover these foundations. Part Six shows that Jesus authenticated both Testaments, and that the four foundations are present in his teaching. 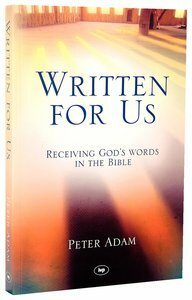 This fresh, energetic presentation is a valuable complement to the author's previous works on the function and application of Scripture in Christian life and ministry. Peter Adam is Principal of Ridley College, Melbourne, and a Canon of St Paul's Cathedral, Melbourne. He is the author of Speaking God's Words: A Practical Theology of Preaching (IVP), Hearing God's Words: Exploring Biblical Spirituality (Apollos), Written for Us: Receiving God's words in the Bible and a contributor to the New Dictionary of Biblical Theology (IVP).